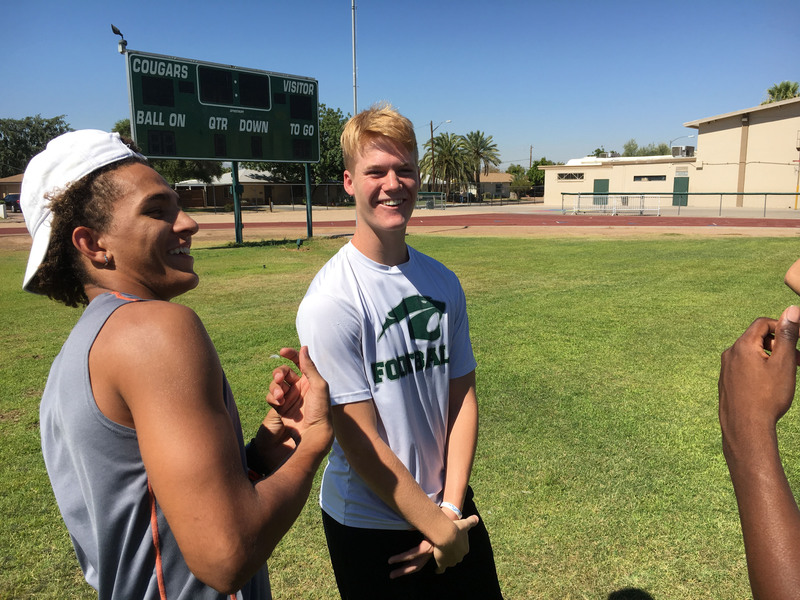 PHOENIX – In the rising heat of a recent summer morning, teenage boys congregated on Phoenix Christian School’s football field, waiting to take turns going long for passes. Mike Chavez, sports director for Heart for the City, ignored the thickening Valley air. Chavez, 27, said he makes sure they exercise safely and get enough water, but that the heat is just another life trial the boys must overcome. Heart for the City, founded by pastor Joe Eriquez, integrates sports with community outreach, giving inner city youths healthy ways to blow off steam, build a sense of community and develop as adults. Chavez said the program encouraged him and his teammates to run stadium laps at noon instead of in the cooler hours. A study published last year by the Association for Applied Sport Psychology showed an improvement in reported self-control by students who participated in community sports programs. Members of vulnerable populations reported they had more self-restraint when coaches fostered a supportive culture that valued all participants. When Chavez was a child, he didn’t get many choices beyond the choice to just survive. Starving in his addict mother’s apartment for a week, he found a jar of peanut butter to hide beneath his bed and fed his infant sister licks from it to sustain her. His grandmother took over raising him, and in high school, a friend of his invited him to come out for baseball. That was how he met Eriquez, who set him into adulthood and inspired him to begin mentoring young athletes. Chavez has the boys training intensively for football in the off-season, with members packing gym time in four days a week. Tito Figueroa, who played center during football season, said he loves lifting weights in the summer and pushing himself harder in the gym than other players. “I think that’s what everybody needs at this age, somebody to push them, just really encourage them to do what they want to,” said the 17-year-old Figueroa. Sweat rimmed his face even in the cool bleachers overlooking indoor basketball courts. He had spent much of that morning wedged in a leg press, pushing against multiple 45-pound weights as teammates heaved and grunted to the sounds of Joy Division and Bon Jovi. Figueroa said he hadn’t received much encouragement in his life before Heart for the City. Figueroa said he plans to finish high school and become a firefighter. He said belonging to a football team is like belonging to a fire department, where teamwork, physical fitness, knowledge of science and of the body all enhance the work and the reward. He especially enjoyed it when other people in the weight room would ask him for advice on technique. It gave him the chance to act as a mentor. Eriquez said this mentoring spirit propelled his decision to found the program 10 years ago. While coaching baseball at Glendale High School from 2003 to 2012. Eriquez saw neighborhood teenagers struggle with exposure to poverty, drugs, gangs and crime. He said many didn’t know how to play baseball because they lacked resources and consistent adult guidance. Eriquez and other community leaders began to cover costs for transportation and gear. In 2007 Eriquez shifted from baseball to football because he saw the more physical sport as a better outlet for teenage males. From then on the newly founded Heart for the City program brought 2,000 youths a year into its community, Eriquez said. Professor Eric Legg, who specializes in positive youth sports development at Arizona State University, said football is often a double-edged sword. On the one hand, he said, it enjoys a broad appeal, connecting an abundance of at-risk kids to caring adults and fostering autonomy. Eriquez said he deters bullying by promoting a kid-first culture on all levels. Every boy stays on the team, regardless of whether they struggle with obesity or lack basic skills. 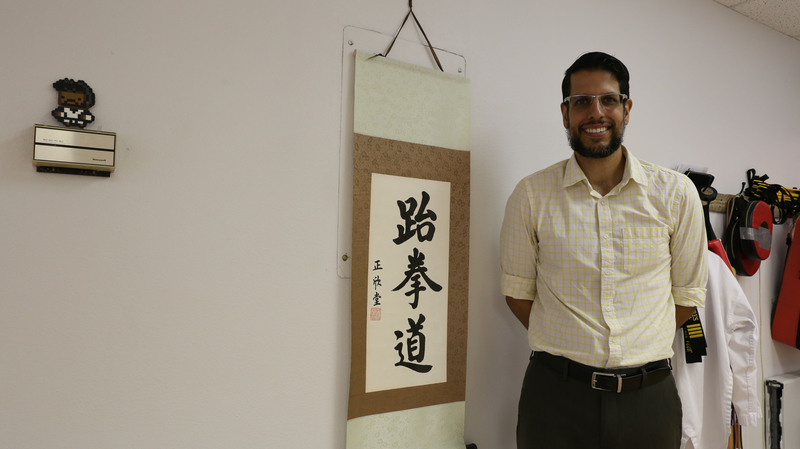 Psychologist Yoendry Torres hosts Taekwondo for mental wellness in an adobe-style business complex in Tucson. Smoothe wood tables and cream-colored sofas invite visitors to breathe easier. Soundscape machines lounge in pockets around the waiting common, filling the air with tropical birdsongs, murmurs of heavy rain or choruses of crickets lifted from a summer night. The adjoining offices offer mental health resources that seek to take the conversation beyond conventional speech – pet therapy, play therapy, yoga classes for foster girls. “We believe talk therapy is not the only solution,” said Torres. Torres first developed his martial arts classes nine years ago for at-risk youths in Chicago’s inner city, where he said neighborhood shootings happened every week. Teenagers confronted with suicidal thoughts, ADHD, depression and anxiety often found relief in sports like Taekwondo, he said. Usually, he said, sports is promoted as a boost for self-confidence and teamwork. His understanding, he said, was that sports psychologists often struggle getting through to teams because of the stigmas surrounding mental health. Athletes may rebuff suggestions that they have need for mental health resources, he said. Counselor Richard Killen works at a Phoenix-based treatment center for adolescents called Doorways. He said chemicals naturally produced by the body during exercise can serve to stabilize the brain in the same way medications do. Scottsdale-based sports psychologist John DenBoer said the chemical dopamine often abounds after exercise too. Dopamine, DenBoer said, is especially helpful to those struggling with depression and anxiety. Then there is the exertion component, he said. “The physical exercise can allow people outlets to basically blow off steam,” DenBoer said. Chavez said that dopamine often equipped players for the stresses of the day by making those stressors feel lighter and less taxing. Eriquez’s coaching style set him apart from others, Chavez said. While other coaches only cared how fast Chavez ran, how well he could catch, what he could do for them in return, Eriquez took an active interest in his life. “Every time it was about me,” said Chavez. Eriquez would ask him how home life and school were going in the middle of baseball practice. There, Chavez said, he realized Eriquez cared more about him than he did about the sport – in helping build his character, in helping him personally, in helping him grow skills and tools to communicate. Holistic sports counts in Taekwondo too. A March analysis of multiple studies published by Bar-Ilan University described declines in a range of aggressive behaviors from students who received traditional martial arts training, compared with a similar group of students who did not. Torres said he had seen students build a sense of worth and achievement as they mastered progressively more rigorous moves, sparring techniques and forms. Many built upon this renewed sense of self-worth to cultivate healthier lives focused on career and goals, he said. In May Torres opened his classes to children both with and without disability. Sometimes this more diverse environment required stronger students to slow down for others, he said, but it also nurtured empathy and understanding in children who had no experience with mental health issues. For those who struggled in some way or another, it offered a way for them to earn and receive respect from non-disabled peers. Torres said many of the issues kids struggled with would materialize organically through the physical acts of class. DenBoer said teenagers faced with academic challenges, problems in key subjects or learning disabilities often find a powerful vehicle for leadership development and communication in sports. For them sports offers different avenues for growth that they wouldn’t otherwise be getting, he said. Sneakers squeaked across Phoenix Christian’s courts as teenage girls thumped a volleyball around a net. Michelle Ma, 16, dove in for a save, landing prone on the floor as her fists sideswipe the ball. She stood on the court’s edge during a break in the action. She said that as time passed and she grew involved with more Heart for the City events, she had to overcome her initial shyness. She eventually met shy newcomers with whom she could empathize and help to open up. Ma, who doesn’t have a father in her life, said her coach’s kindness and encouragement meant a lot to her. Chavez said the time Eriquez spent with him had a powerful impact on a boy who’d spent his early years moving from place to place. Chavez said he lost two close friends in gangland shootings before and after college. He said many of the people he knew who were involved with gangs weren’t bad people. They’d just developed bad habits, making maladaptive decisions to pay bills or survive. One day, he said, some schoolmates linked to gangs told him to stop hanging out with them. Chavez was taken aback, telling them they were like family to him.  Cronkite News reporter Patricio Espinoza contributed to this story.